Separate apartment for 4 in the ground floor of the owner's house on wooded and fenced located Ver sea 200 meters from the sea. Tennis, mini golf in front, pony club sailing school in season. Accessible people with reduced mobility. Site of the landing beaches, near Arromanches, Courseulles, Bayeux, Port en Bessin and Caen. Comfort: living room with open kitchen: oven, electric hob, fridge, microwave, grill, coffee maker, toaster, iron, flat screen tv, English channels, dvd player, board games.Lave-linge. 2 rooms with tv, one with a bed of 140 plus a bed for baby and one with two beds of 90. 2 rooms of water with toilet of which one arranged for person with reduced mobility. Terrace, garden furniture, barbecue, fenced. Linen provided (cloths, towels and sheets). Beds made on arrival. weekend rental, week and per night depending on season. Breakfast Price: 60 euros per night per room with breakfast outside school holidays. 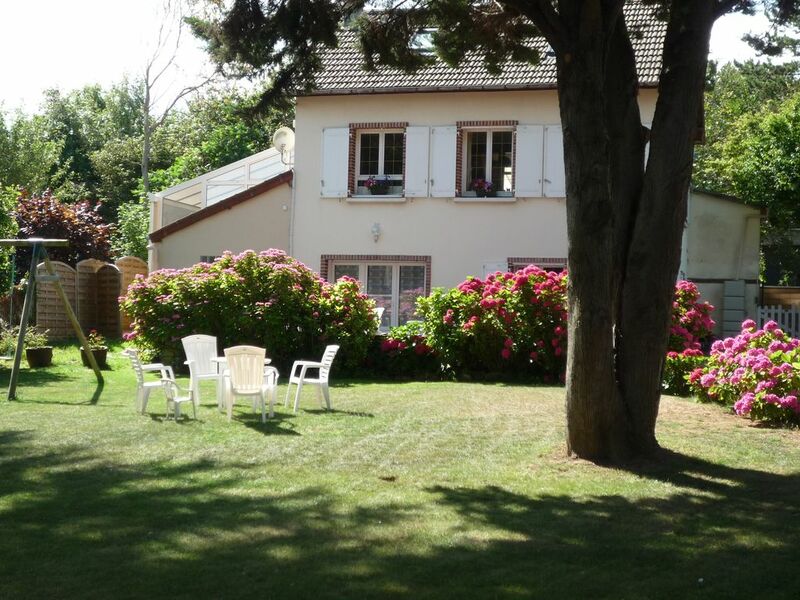 This is a well located property to visit the attractions of Normandy. Whilst there we were able to easily access the D Day beaches, Mont St Michel, Bayeaux and Caen. Guests can easily walk to a local restaurant if home cooking is not for you. The property has off street parking and with two bathrooms and suits couples travelling together. The host was polite and friendly. Potential guests should check beforehand regarding a substantial security deposit as this was required of us at checkin.....although this was reduced when we couldn’t readily assemble so much cash. We were not aware of this requirement until we arrived st the property. Guests also should bring any consumables such as condiments, cleaning materials, disinfectant, dish washing liquid, cooking oil, tea and coffee as these were not available. Even toilet paper was quite limited. This is a nice, older style property but guests should come well prepared. I allow myself to answer your comment on my cottage. First concerning the deposit requested, it appeared on the quote provided by Abritel during your booking, moreover I reminded you when I replied to your email asking me to have the opportunity to pay the balance of your rental in cash on arrival.On the other hand, you rented my accommodation and not bed and breakfast where I provide in each room tea, coffee, milk, mineral water and cupcakes. breakfast in the morning. In your case it was only a simple rental. I remind you that in my rental there was provided the linen with the beds made upon your arrival, tea towels, napkins and towels in each bathroom with two small soaps and two small baths shower in each bathroom. There were two rolls of toilet paper in each toilet and this for 4 days. You had dish soap and a sponge near the sink. It is not usual in a rental in France to also provide groceries. At your arrival a welcome basket was waiting for you with a bottle of cider, one of perry and shortbread of the region. I hope to have provided enough information for future rentals that you could do France in the future and hoping that you have benefited from our region. We were in France visiting our exchange student and traveled to visit the beaches of Normandy. Catherine's home is beautiful.You have access to a lovely garden were we sat outside and had dinner an played cards. The lower floor of the home is all yours with 2 large bedrooms and two full bathrooms. The kitchen has everything you need to cook. It is well cared for and decorated with love. We had a great time in Normandy and this was the perfect place. I would recommend it to anyone traveling through the area! Location, location, location.Great stay for exploring D-Day beaches...minutes from Arromanches. The ext. of this gated home was attractive & in good repair. The owners, Catherine & Dominique were on-site upon our arrival. The welcome basket of apple juice, cidre & normand cookies was much appreciated. The CASH deposit was collected & returned promptly after inspection. Our hosts had helpful info. on nearby sites & activities. Upon our request for a dinner recommendation, they were so kind as to make us reservations. Made beds, towels helped us settle in quickly. The house was as in the photos. The back bedroom was separated by a door. Its small bath was quite cramped. If you can do without a "living room" then all is well. We missed this feature in the evenings, but we were able to play games at the large table which has 4 straight chairs & 2 upholstered chairs in the common area with a small flat screen TV w/ Eng. channels. Everything was available for us to prepare & eat meals: two hotplate burners, a toaster oven & microwave. No oven. A grill was mentioned, but not provided. Toilet paper & trash bags were onsite at the outset, everything else, including small things like coffee filters, salt, pepper & dish soap, were not. In other rentals, these 4 items, were onsite. We left these items on the shelf for the next renters, gave everything else to owners. Our two negatives were 1. the large spiders that greeted us on the first night when we arrived home after dinner. We were told Sept/Oct is the time when spiders come indoors. Since this "apartment" is in the lower half of the owners' house at ground level with lovely hydrangea bushes all around, it is an entry point via doors & open windows, although shuttered with electric controls. Despite our owners coming immediately with the sweeper and ridding us of the ones we killed, & others that 1st evening; they were with us throughout our stay. Flashlights upon waking to check floors & ceilings! They left us "Spider Stop" to spray at access points, but it was an ineffective deterrent. Broom was useful. Creepy for others, but I am phobic! 2. There was a pervasive mustiness from the humidity that permeated the atmosphere, our clothes & cpap machines. By far, the most troublesome feature. Keeping the windows closed (spiders), there was no way to circulate the air & dry out the dampness. Only a dehumidifier, small fans & a good cleaning would have resolved the mildew present. The small ceiling fan in the large bathroom wasn't independent of the ceiling lights, so impractical to run 24/7. Seasonal? Perfect for the four of us - 3 adults and a 2 year old. House convenient to everywhere we wanted to visit. Warm when needed. All cooking / cleaning facilities available. Hosts who live upstairs greeted us generously and were available if needed. Thank you for this nice appreciation. Happy to have receipts and the pleasure to see you again for next holiday. This is a wonderful location for exploring the area. A perfect combination of country and beach without all the traffic. Owners a very gracious hosts. Au calme, idéalement située. Bon séjour. Propriété correspondant bien aux photos, très bien située pour visiter les sites du débarquement. Propriétaires accueillants et chaleureux. Grand terrain clos, idéal pour le chien. Nous avons passé un bon séjour. nuitée chambre d'hôtes avec petit déjeuner : basse saison 60 euros la chambre. Haute saison 78 euros la chambre.